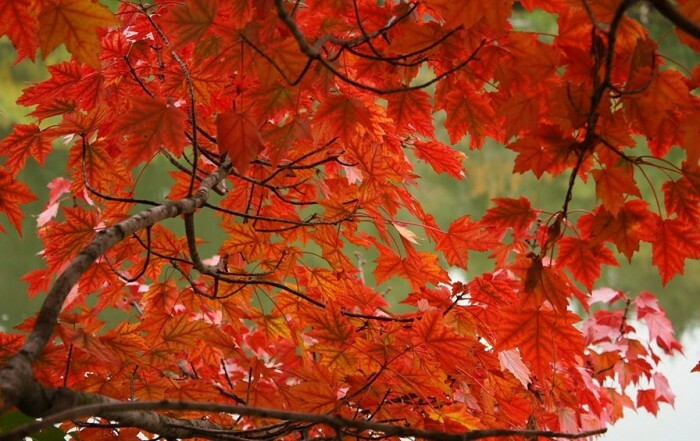 The Red Maple is known for its brilliant red foliage. It is one of the first trees to change color. It is fast growing and can reach a height between 40 to 90 feet and live to be 150 years old. Its sap can be used to make Maple Syrup. It is the state tree of Rhode Island. No one seems to know the whole story of why it was selected by the citizens of this smallest of states. In the 1890’s a Rhode Island school commissioner gave students a list of trees and asked them to vote on their favorite. Red Maple won, but it was not until 1964 that it was officially adopted as the state tree – making Rhode Island one of last states in the nation to proclaim its tree. The selection may have been because Rhode Island is from the Dutch, meaning “red island.” Since the state bird is the Rhode Island red hen, it makes sense that the tree would be one noted for red. The nation’s largest Red Maple lies far to the south of Rhode Island in Great Smokey Mountains National Park. This tree was declared champion in 1997 by American Forests and is listed in the National Register of Big Trees as being 141 feet tall and just over 7 feet in diameter at 4-1/2 feet above ground.